James Olson is a former chief of CIA counterintelligence who worked for 31 years in the agency, mostly in foreign assignments conducting clandestine operations. Twenty years ago he joined the faculty of the Bush School of Government and Public Service at Texas A&M University, where he remains today as a professor teaching courses in intelligence, counterintelligence, and international crisis management. To Catch a Spy begins with introductory chapters on what are viewed as the three primary counterintelligence threats faced by the United States: China, Russia, and Cuba. Olson describes the intelligence organizations that are active in each of these countries and provides brief summaries of the most impactful cases that have involved them. Interestingly, while China is the most dangerous opponent, followed by Russia, Olson tells us that “pound for pound,” the Cubans may be the most effective in their operations against the U.S. He then proceeds to set out what he views as the Ten Commandments of Counterintelligence. Previously published in 2001 as an article in the CIA’s periodical Studies in Intelligence, these commandments include such concepts as playing offense rather than defense, owning the street, paying attention to analysis, and not staying in the profession too long. He follows his commandments with a chapter on preventing counterintelligence incursions through the development of better workplace security. Improvement may be achieved, he explains, by following his Three Principles of Workplace Counterintelligence—careful hiring, proper supervision, and responsible promotions. Olson then spends two chapters on double agents and how to manage them before concluding with what he tells us is his favored method of training: the case study approach. He presents 12 case studies in all, featuring individuals he mentions throughout the earlier chapters. 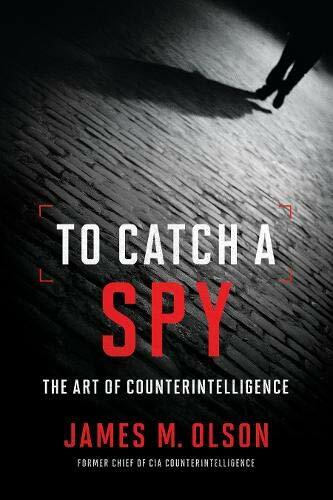 To Catch a Spy is not terribly well written. Olson’s prose is clunky, most of his paragraphs are rather long and serpentine, and he has a habit of abruptly breaking off some of his war stories before reaching their conclusion. So . . . what happened then? We’re not sure. He tells us in his introductory Acknowledgements that the manuscript was reviewed and approved by the CIA before anyone else could see it, including the publisher. This preliminary screening might explain why it reads at points like a heavily redacted document. That jarring sensation you suddenly experience may be coming from the spike strip stretched across the road by the Publications Review Board, stopping you in your tracks before you get too close to classified information. As well, much of the case material touched on in the book is rather dated. Katrina Leung, for example, operated with FBI special agent James Smith on behalf of China between 1984 and 2004, Ana Montes spied for Cuba between 1985 and 2001, and Richard Miller betrayed his country to the Russians in 1984. While the publisher clearly hopes to ride the current tidal wave of books focusing on current events and national security, To Catch a Spy struggles to the finish line far behind many other, better publications in terms of immediate relevance. Which invites an important question: Who is Olson’s intended audience? To Catch a Spy will provide a useful textbook for students taking Olson’s courses at the Bush School. No doubt they will be quizzed on his ten commandments, the three principles of workplace counterintelligence, and other key points. It will also help them write summaries of important counterintelligence cases over the years and the lessons learned from them. For the general reading public, however, To Catch a Spy doesn’t really appeal. Those looking for “juicy new disclosures” will be disappointed as they wade through material just as easily accessed at no cost by googling for it online. As well, his overall tone at times is a little puzzling. Perhaps most bothersome is his discussion of effective selection of personnel as part of good workplace counterintelligence. After virtuously declaring that sexual orientation has been disproved as a legitimate basis for rejecting CIA applicants, he then proceeds to assert that affirmative action, on the other hand, has resulted in a lowering of hiring standards. So if, for example, you’re a young African American woman considering a career in intelligence and you encounter this tired old canard from a key figure in senior CIA circles, especially one so influential at the training end, you might tend to reconsider applying for a job in a field with such an alienating, politically skewed culture. If James Olson’s intention is to encourage American intelligence institutions to press the reset button and regain control of the counterintelligence battle through new methods and a refreshed workforce, it’s difficult to see how To Catch a Spy will assist in any real way.